Although ice cream flavors with cookie or cake pieces are verboten for those with celiac disease, there is a reasonable facsimile available in local markets. Turtle Mountain makes a line of non-dairy frozen desserts under the name Purely Decadent Dairy Free, and among the gluten-free varieties are Cookie Dough, Blueberry Cheesecake, Key Lime Pie and Snickerdoodle. All of the "doughs" in these pints are made from rice flour. Those flavors, along with more than a dozen others, are made from organic soy milk. 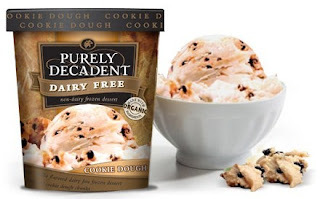 The company also makes a gluten-free cookie dough variety with coconut milk. (Note that the Chocolate Brownie Almond and Cookie Avalanche flavors are not gluten-free; a complete allergen identification table is posted at the company's website.) During the manufacturing process, Turtle Mountain tests for gluten and will not distribute a batch if results indicate more than 20 parts-per-million. In the Philadelphia area, Turtle Mountain products are sold at Acme, Clemens, Genuardi's, Pathmark, ShopRite, Super Fresh, Wegmans, Weis, Whole Foods and local natural food markets. I LOVE Purely Decadent key lime pie! And their coconut milk cookie dough flavor is my all-time favorite! I usually buy them at Essene. Thanks to Turtle Mountain for making such incredible dairy- and gluten-free frozen desserts. When it comes to eating ice cream, I don't feel deprived at all.